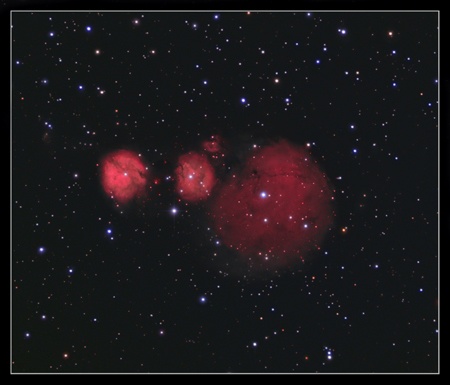 IC 2162. Emission nebula complex in Orion. This is an interesting star forming region a little over 8000 light years away which can be found in Orion, near the Orion/Gemini border. It is composed of 5 Sharpless objects, from left to right, SH2-258 (very faint hint), SH2-255(IC 2162), SH2-257, 256 (just under 257) and the large and diffuse SH2-254. .the two main regions are quite bright but I wanted to capture the fainter regions too, and had to throw a lot of imaging time at it. To be honest, I'd like to have gone deeper but a 6 inch scope will only go so far in a reasonable length of time! Adam Blocks image has more faint detail, but he was using a 20 inch RCOS, and unfortunately I don't have one!! .very time consuming but quite effective when nothing else works!! Imaged over several nights in November and December 2009, and January 2010. B. 15 x 360 seconds.